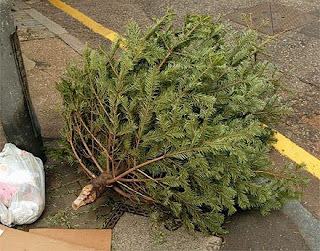 Stockwell residents will be able to recycle their Christmas trees again this year, as Lambeth Council launches its free tree recycling service from 5 January 2009. The service has been set up to make recycling easier than ever. Residents who have a real Christmas tree and live in a kerbside property can leave it next to their refuse bin in the week beginning Monday 5th January, and the council will take it away and recycle it for free. The tree should be left at the front of the property before 6.00am on the day of collection, and all decorations should be removed. People who live in a Lambeth Living property can simply leave their tree next to their estate recycling bank (also in the week beginning 5th January). It's estimated that each person in the UK will throw away an average of 50 kilos of waste over Christmas, about three million tonnes overall, although a lot of this waste, for example wrapping paper, Christmas cards, and plastic and glass bottles and cans from Christmas parties can all be recycled. Cllr Sally Prentice, Cabinet member for Environment on Lambeth Council, said: "We all create a lot more waste during the Christmas period and Lambeth Council is making it easier than ever for people to recycle; our door-to-door Christmas tree recycling service is part of this drive. It’s also worth remembering that people can recycle clothes, toys, books and unwanted Christmas presents at local charity and second hand shops which are always looking for good quality items."